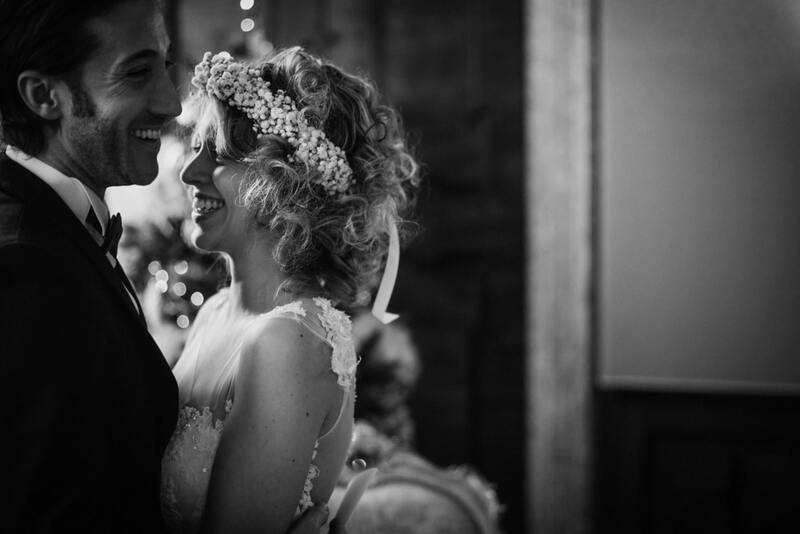 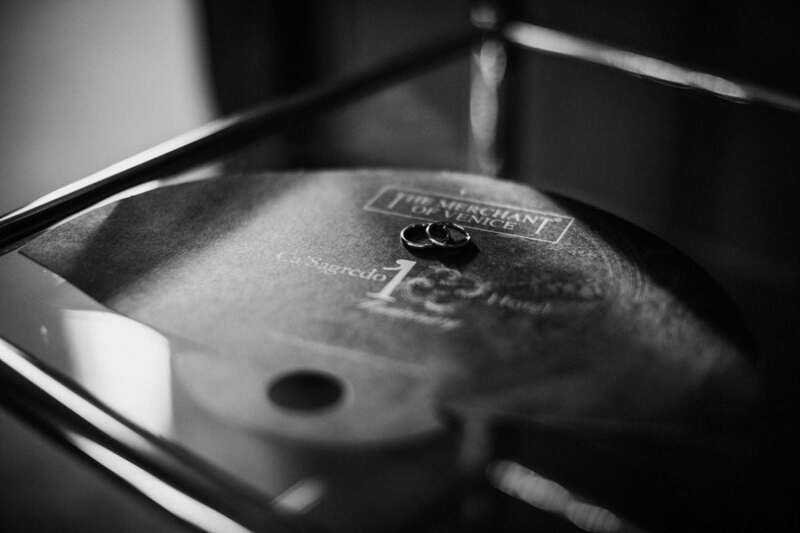 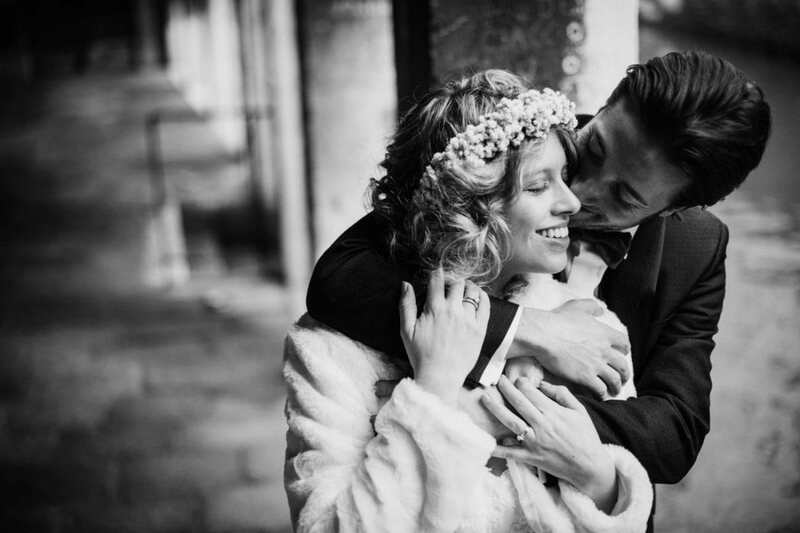 We do love shooting and filming elopement weddings, as they are often the most personal ones. 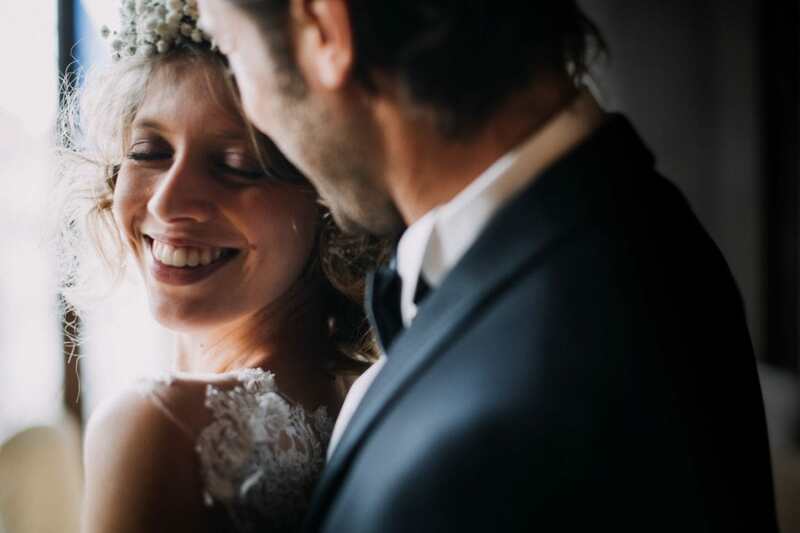 Just saying I do to your significant other – it’s a wedding and honeymoon combined! 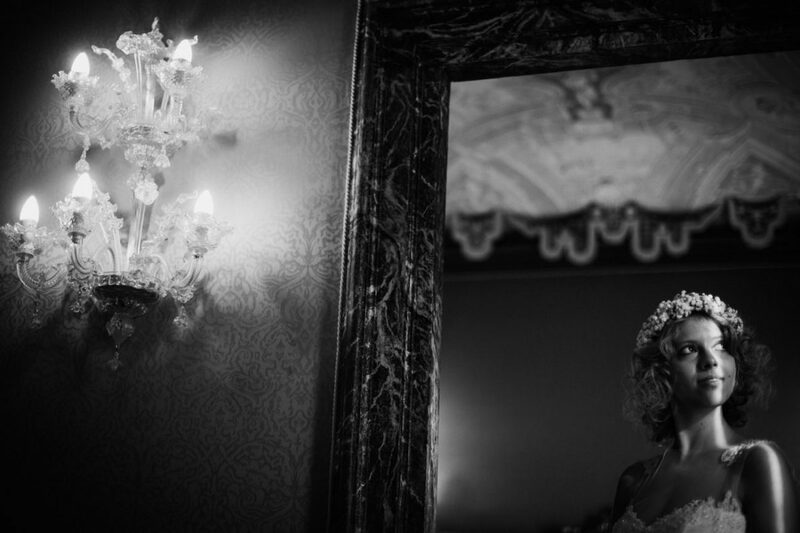 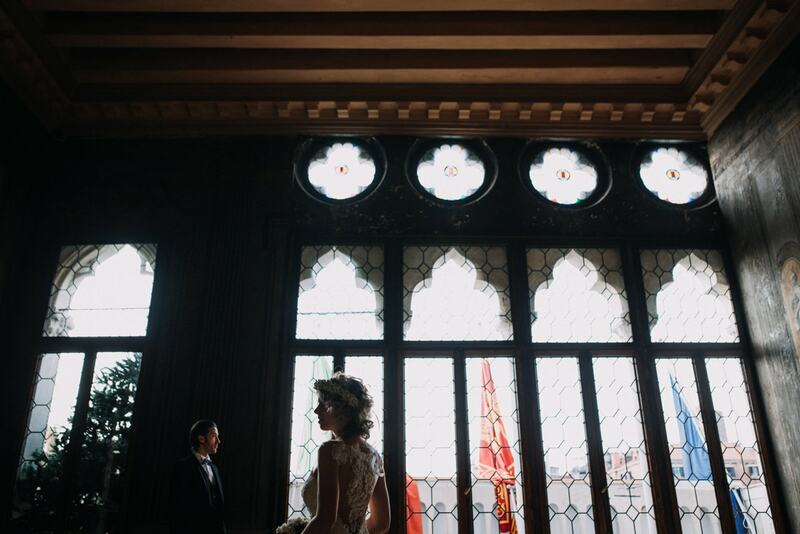 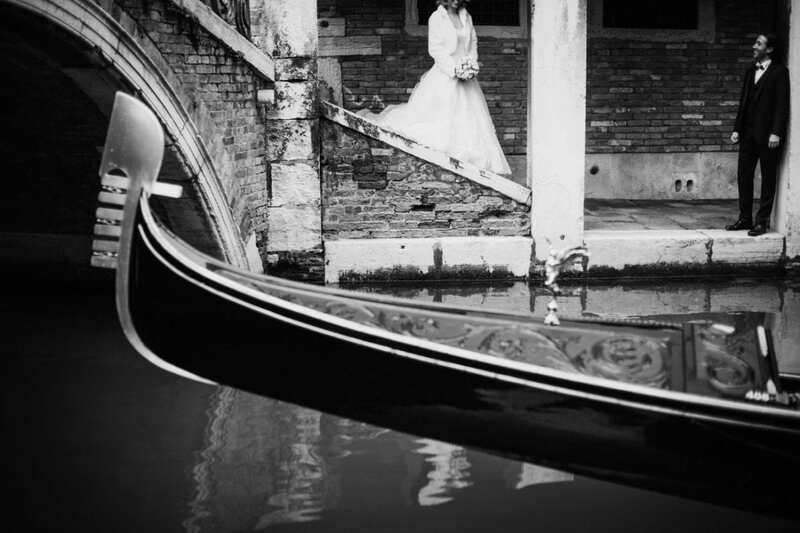 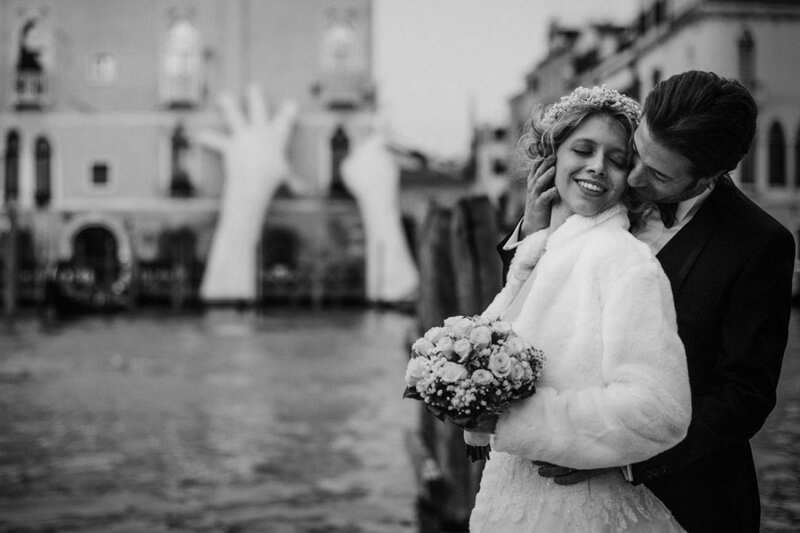 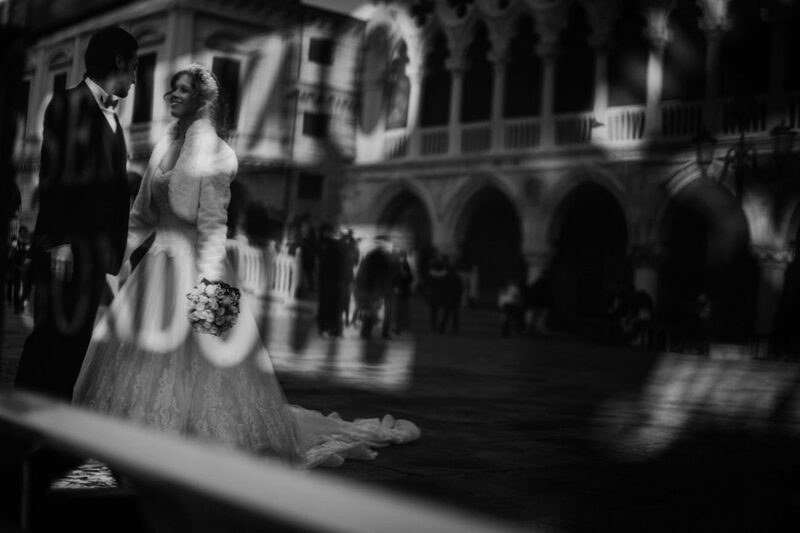 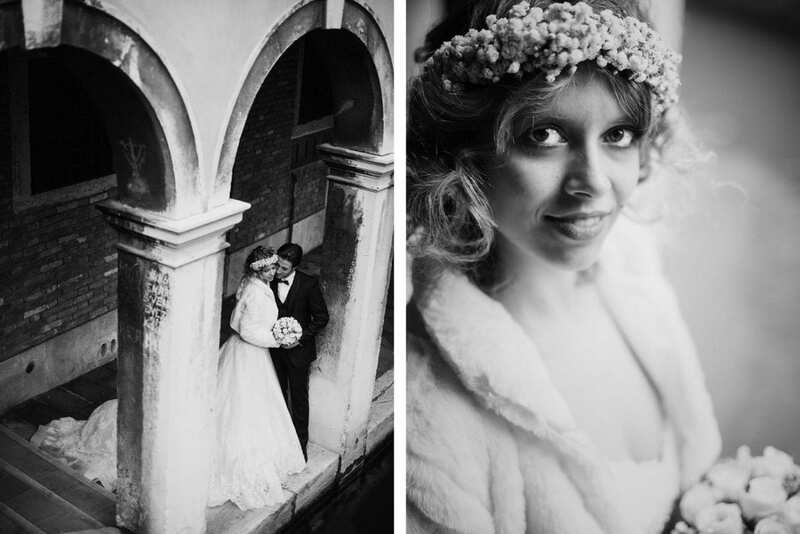 We often shoot elopement weddings in Venice, and this one is one of our favorites. 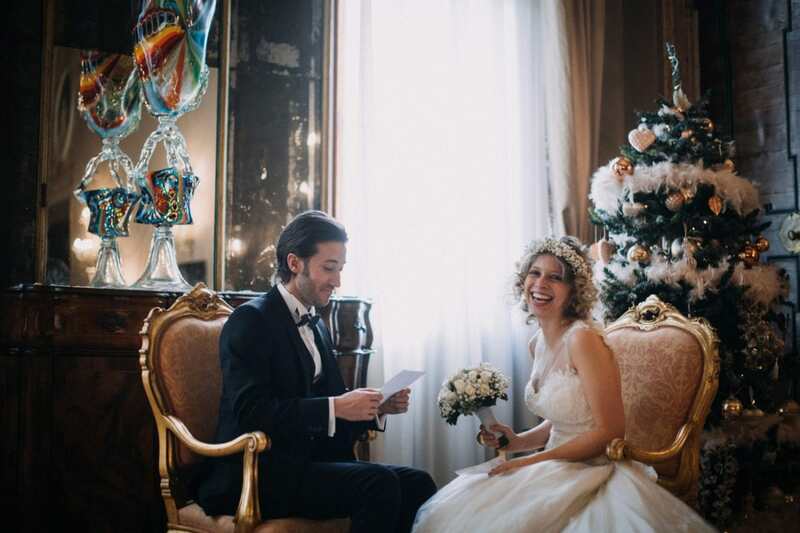 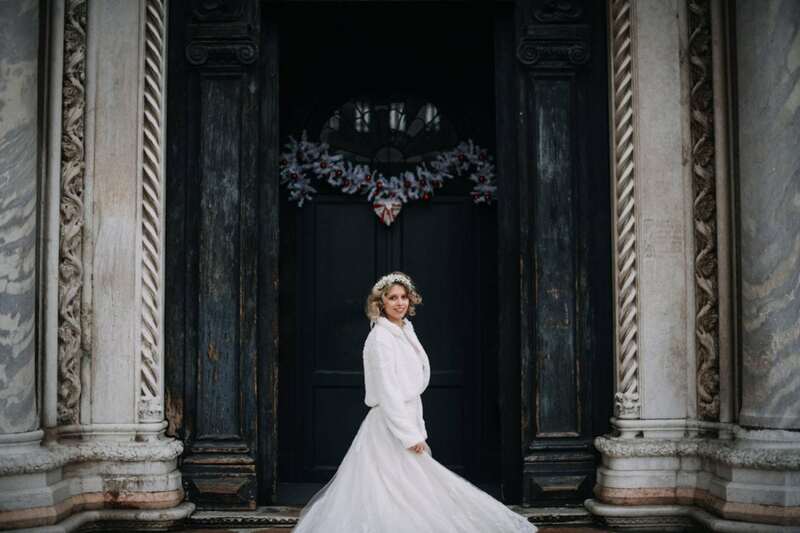 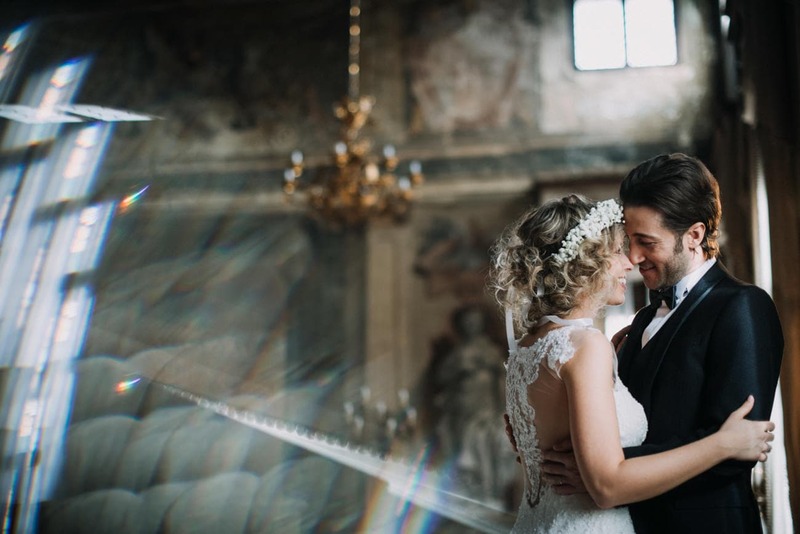 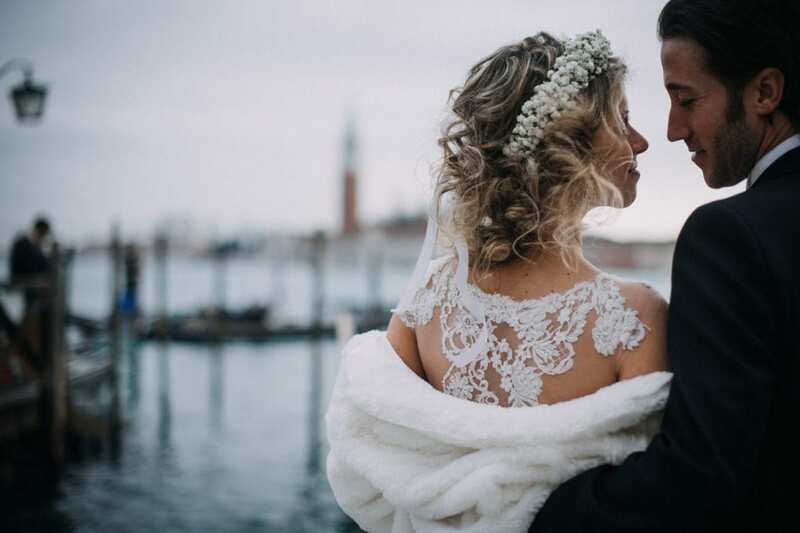 A stunning location (the amazing Cà Sagredo, just a few steps far from Rialto), a beautiful couple and a romantic symbolic ceremony by the Christmas tree – just lovely! 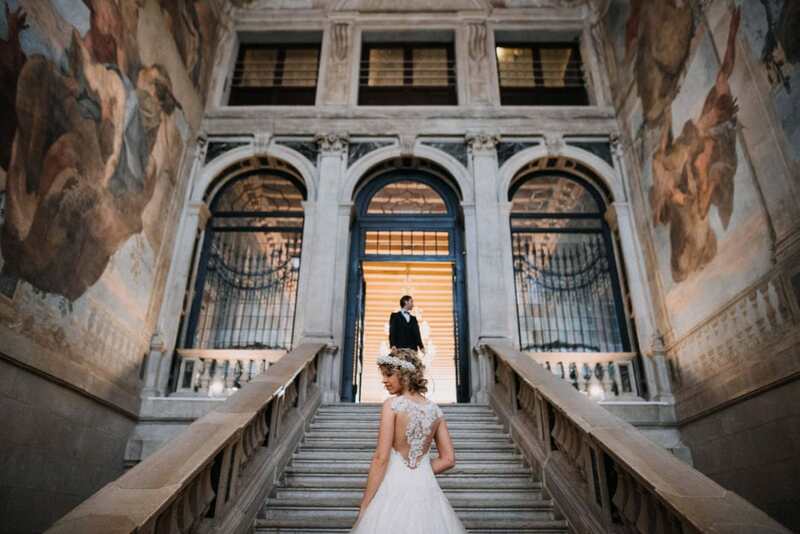 Ca Sagredo is one of the most beautiful Palaces of Venice. 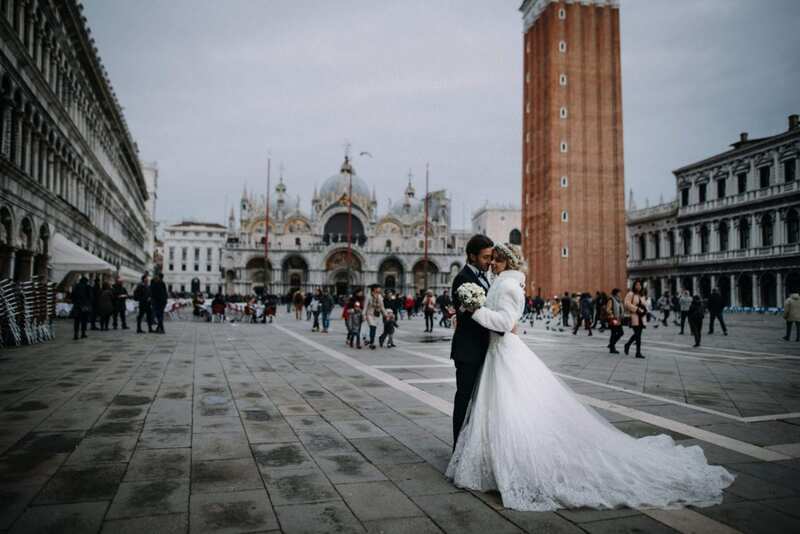 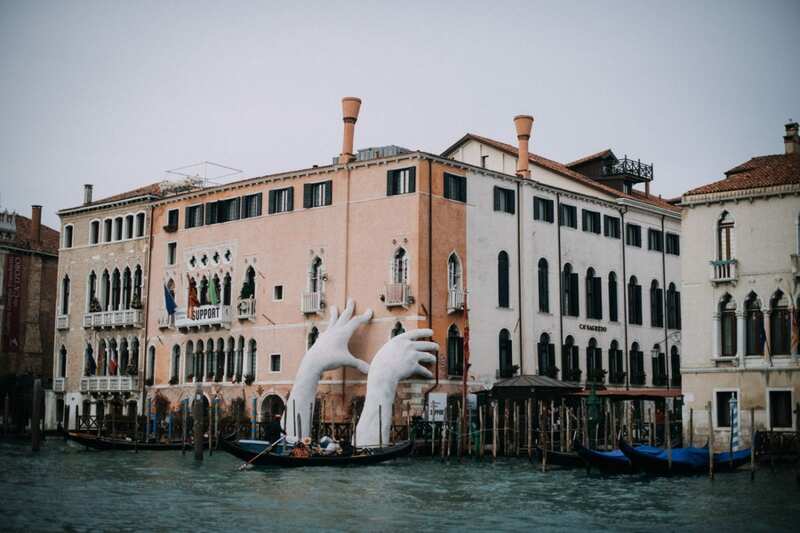 It has an incredibly long story: it was first built in the late Fourteenth Century, the completely restored in the Eighteenth Century, in the Golden Age of the Venice Republic. 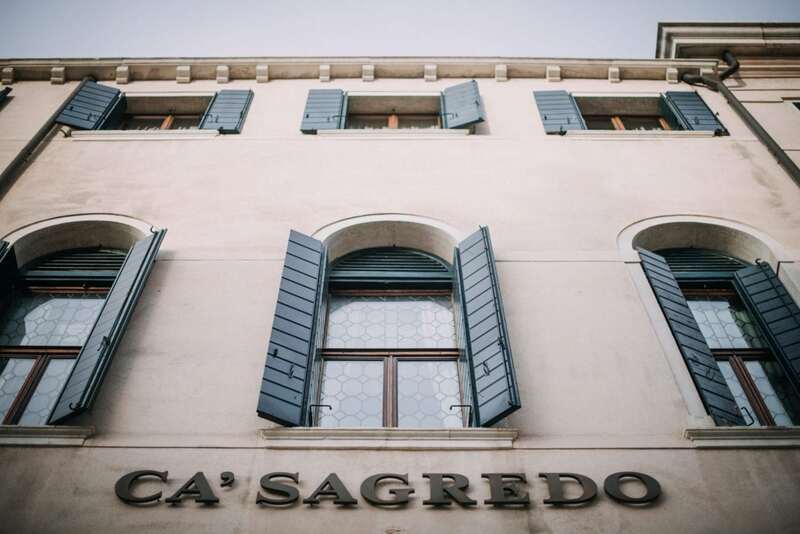 Nowadays, it is a beautiful 5 stars hotel and most of the original frescoes and halls are kept as they used to be back in the age of the Serenissima. 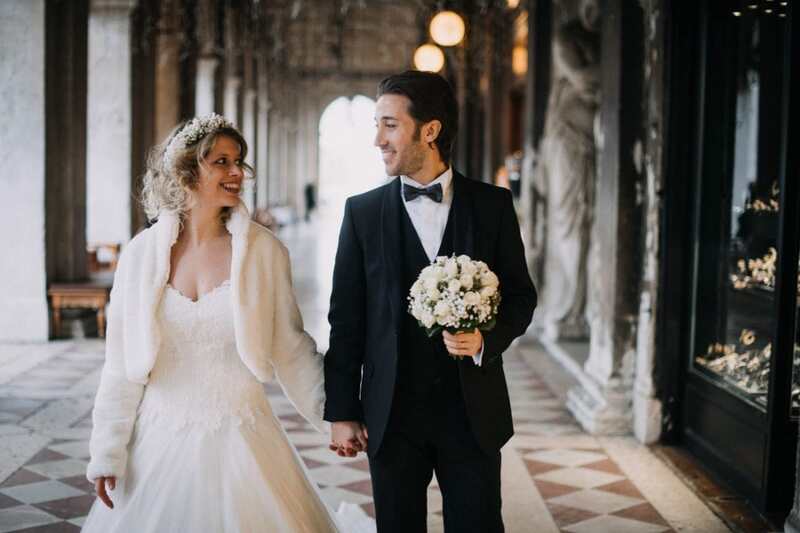 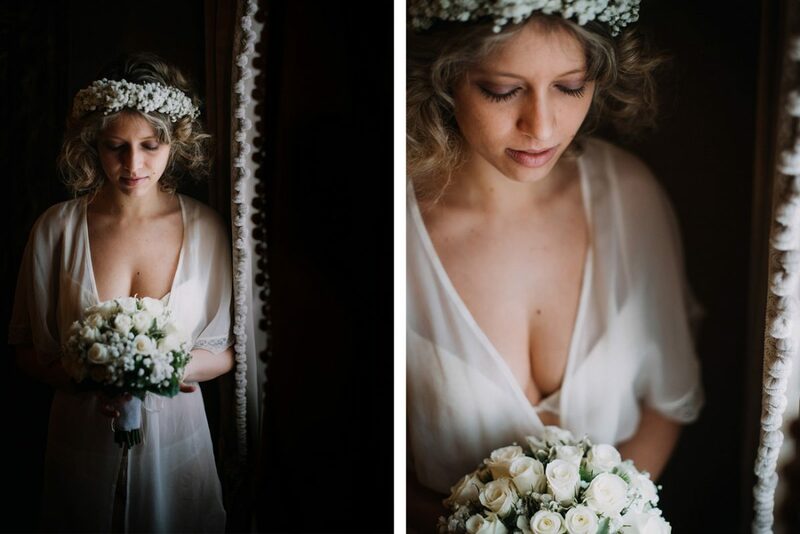 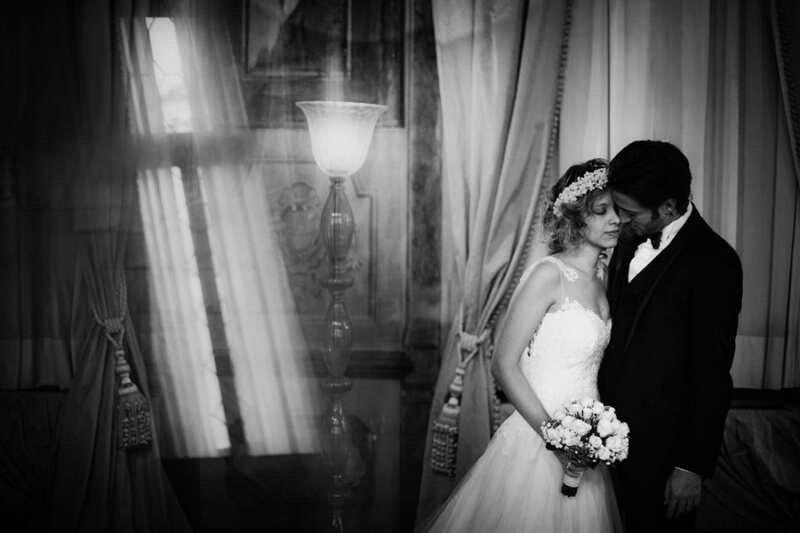 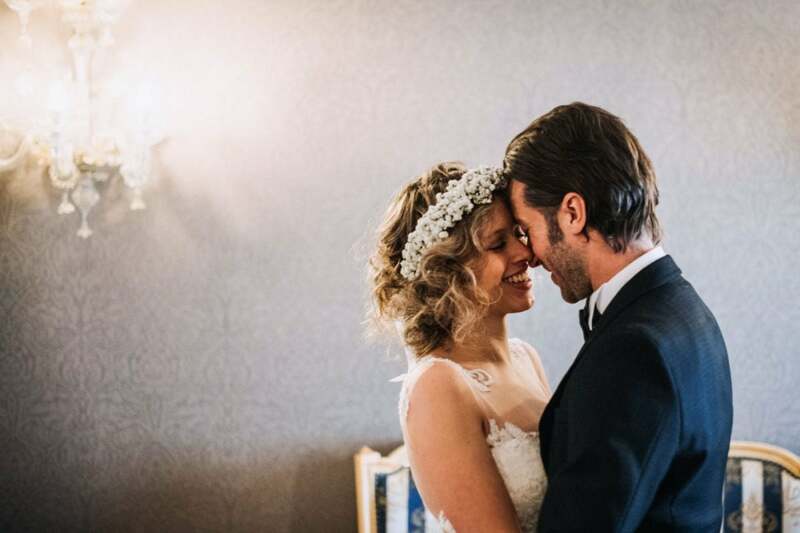 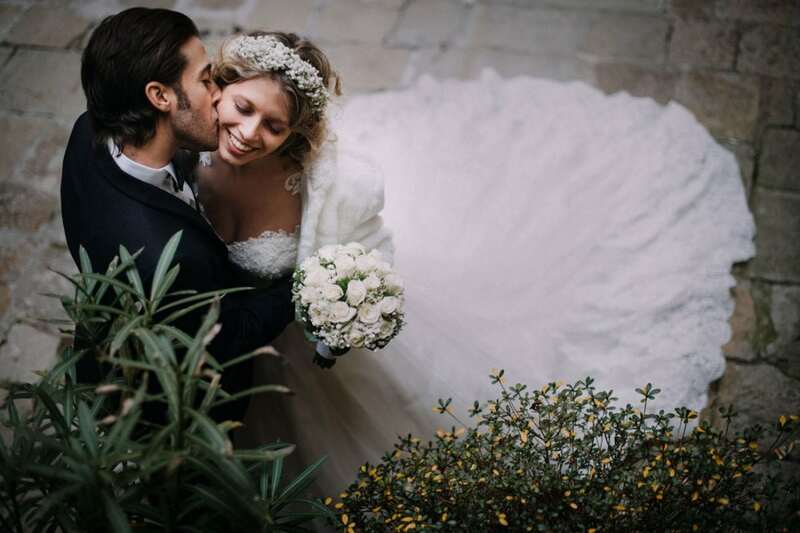 Elisa and Mattia chose this wonderful hotel for their elopement. 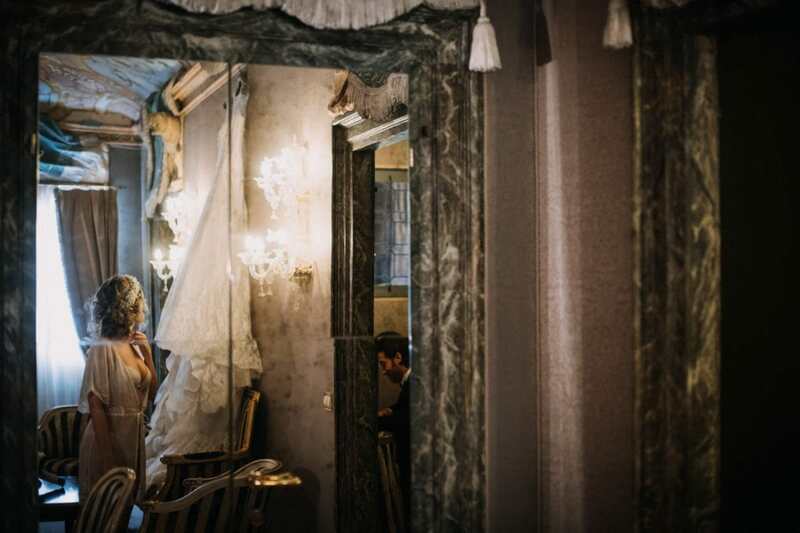 They got ready separately in the amazing Suite 316, once called Sala degli Stucchi, a wonderful suite fully frescoed by Venetian artists of the Eighteenth Century. 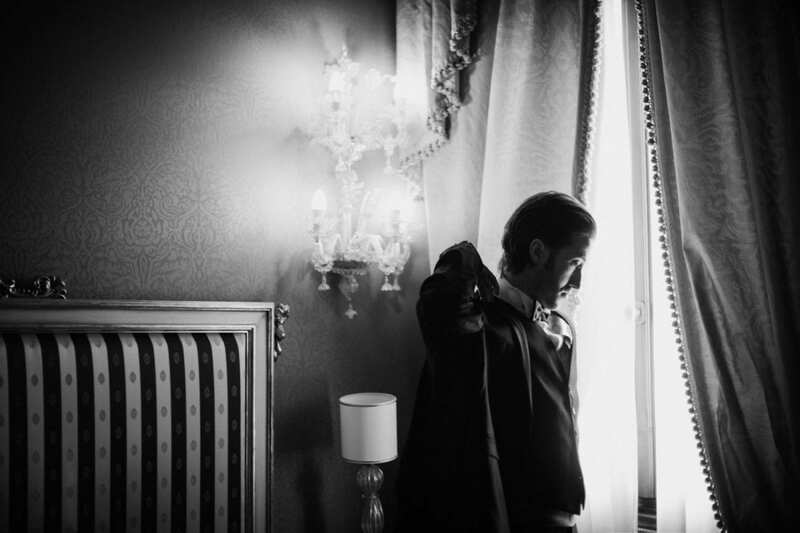 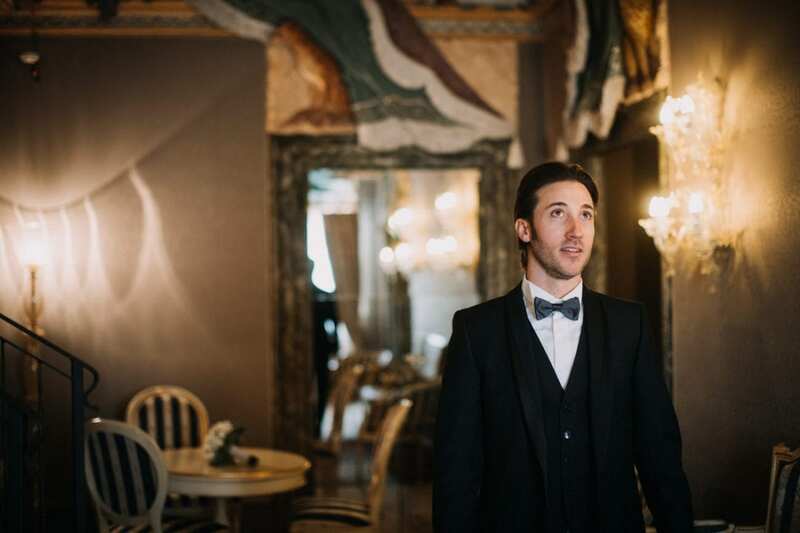 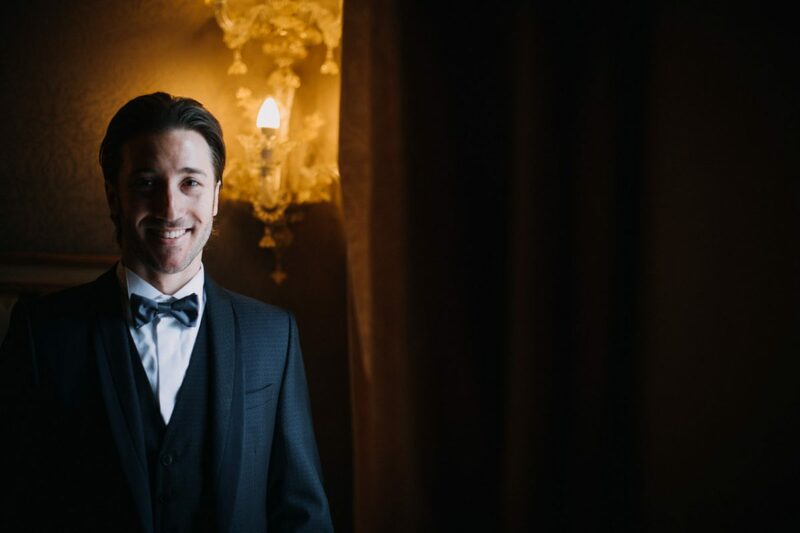 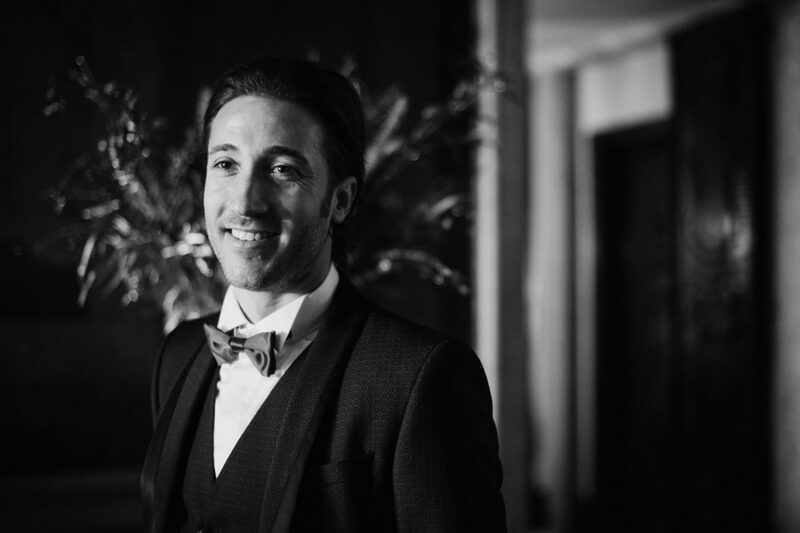 Mattia got ready first, putting his wedding suit in the main bedroom of the suite, then wrote his vows to Elisa. 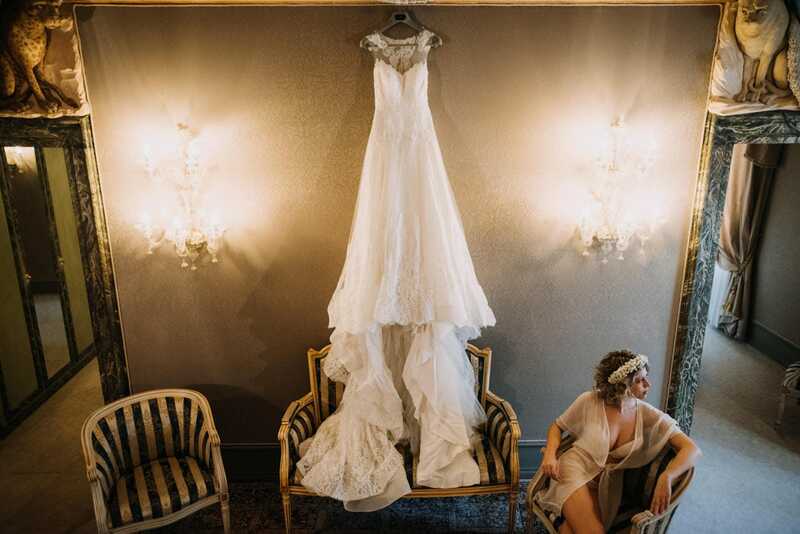 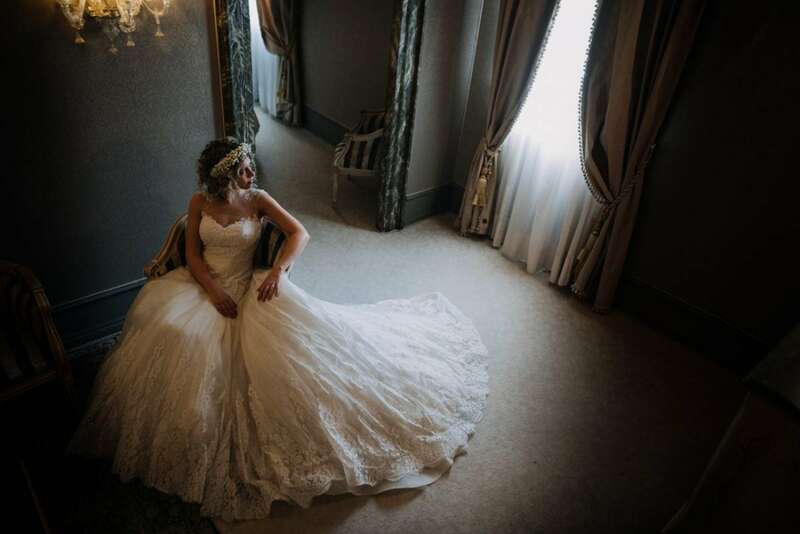 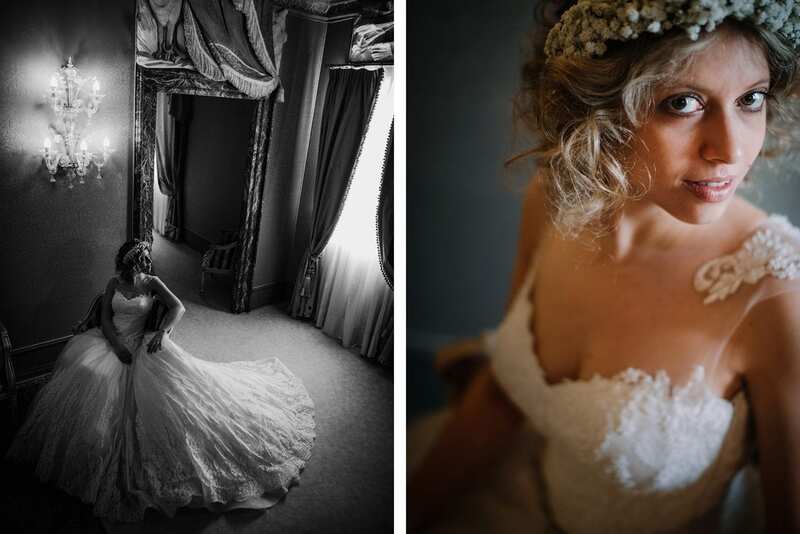 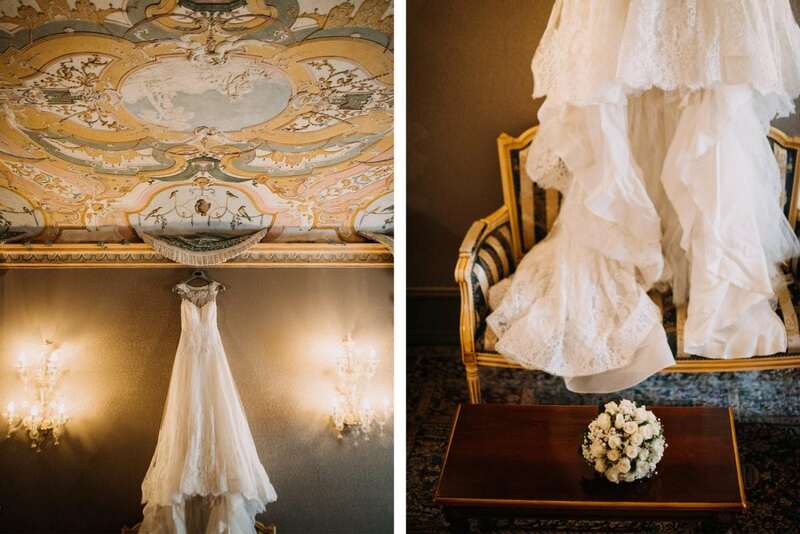 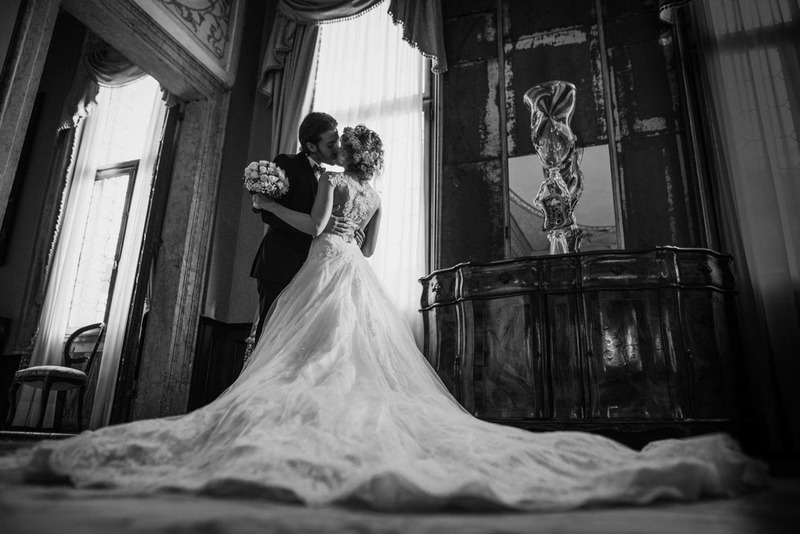 Elisa did the opposite – vows first, then put on her stunning wedding gown in the larger room of the suite. 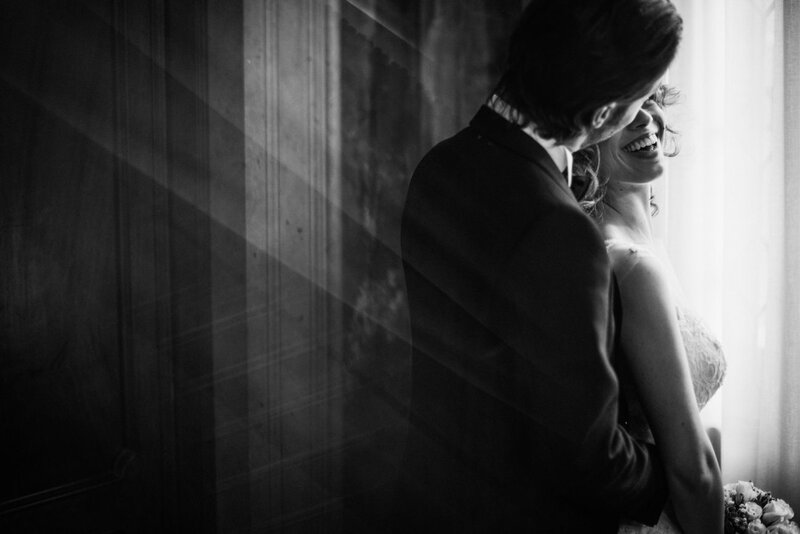 There they had their first look, too: the excitement in their eyes was just moving. 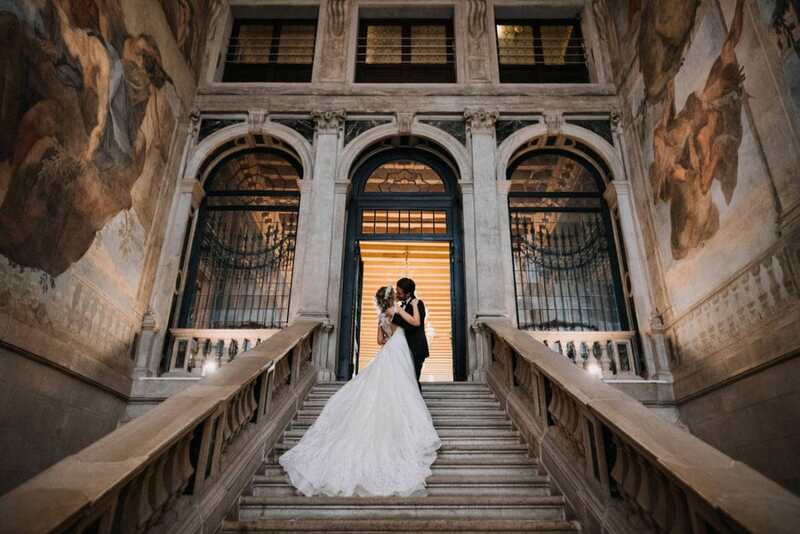 Together, they walked up to the Sala della Musica through the main staircase. 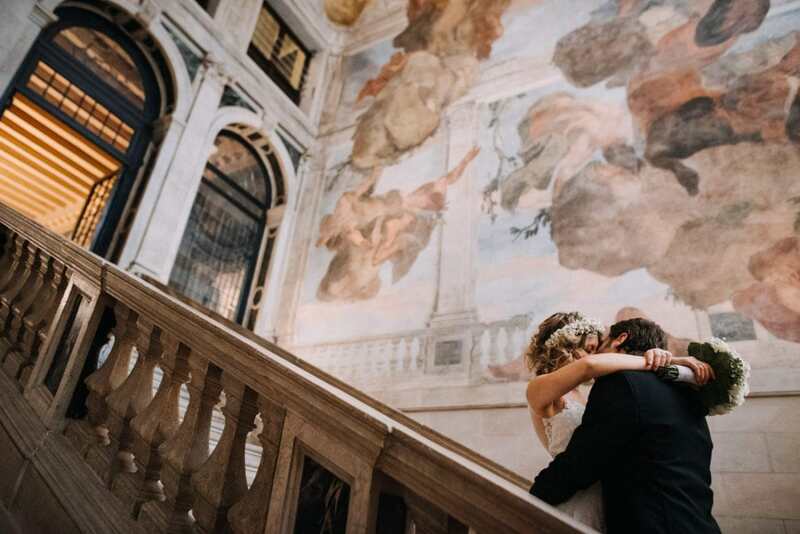 That peculiar staircase is very famous, too – marble and statues of angels, all surrounded by amazing frescoes. 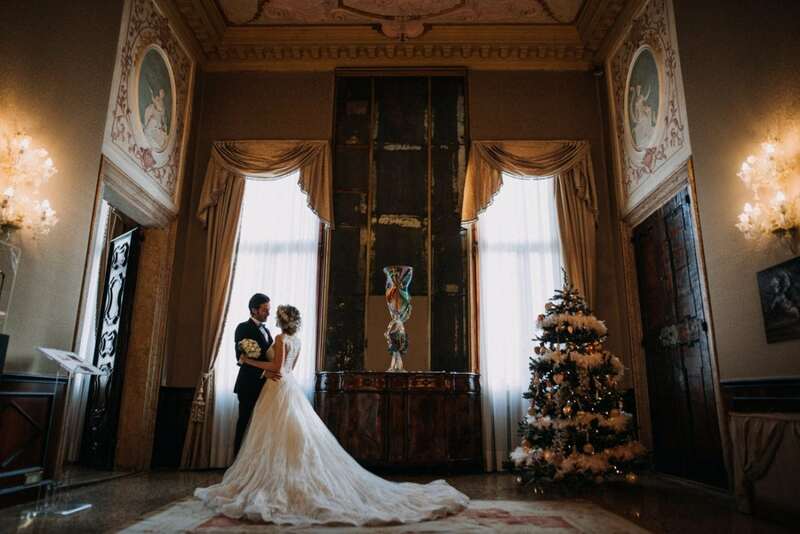 They read their vows and exchanged their rings in one of the coziest halls of the Palace, just next to the Christmas tree. 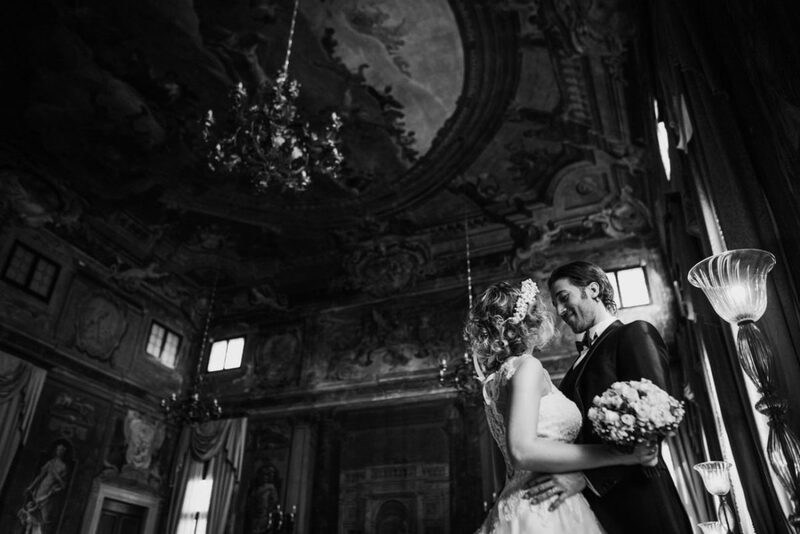 We had a part of the wedding couple photo session inside Ca Sagredo, between the main staircase and the wonderful frescoed halls. 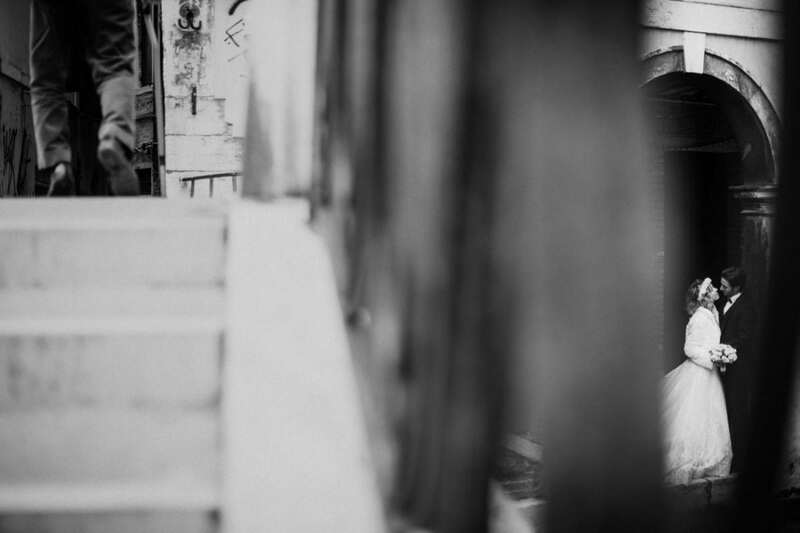 Then we had a walk together around the city, so beautiful and peaceful in early January. 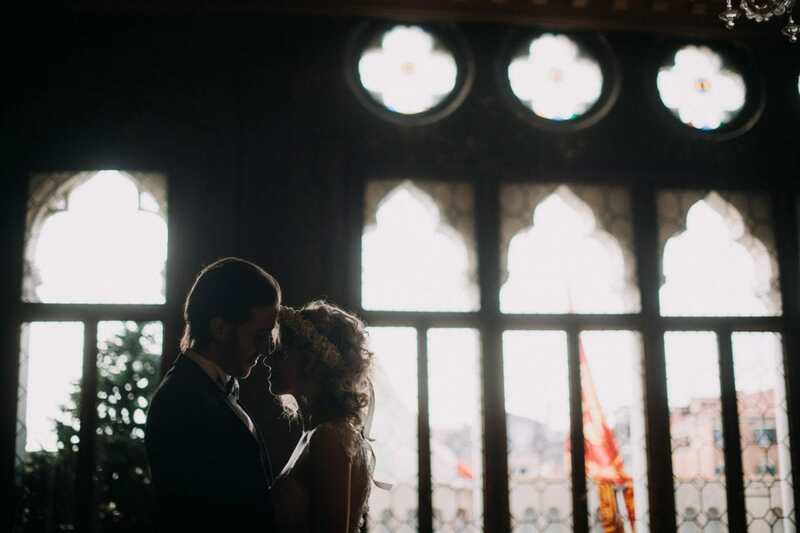 A beautiful love story in one of the most romantic cities of all.